Theobroma leiocarpum Bernoulli, Theobroma pentagonum Bernoulli, Theobroma sativum (Aubl.) Lign. & Le Bey, Theobroma sphaerocarpum A. Chev. A tree indigenous to South America, but now cultivated mainly in West Africa within 20 of the equator. 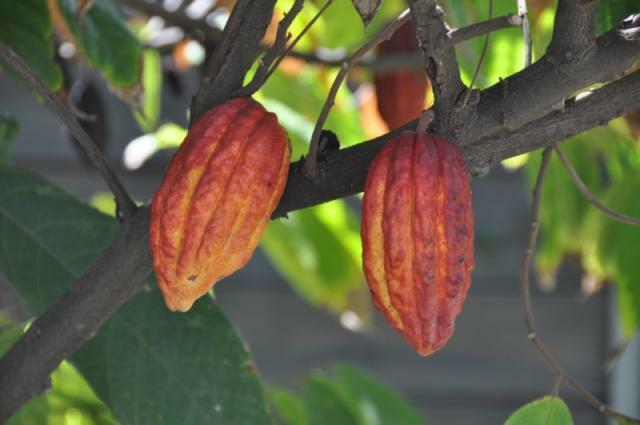 A tropical rain-forest crop, cocoa is cultivated for its beans, which are contained in large red or yellow pods growing directly on the stems and branches of the tree. Indigenous to South America, but now cultivated mainly in West Africa within 20° of the equator. The beans are embedded in a white mucilage (together about one third the total weight of the pod). Both the mucilage and beans are taken out of the pod and fermented. The fermented dried beans are then processed in chocolate factories. First, they are roasted to develop flavour and aroma. After cooling, the beans are cracked and the shell winnowed away, leaving the cracked seed kernels known as the nib. The nib is ground to give cocoa mass or chocolate liquor, from which the cocoa fat (cocoa butter) is extracted by pressing. The resulting cake is pulverized into cocoa powder. The pods, being rich in potassium, are left in the field to fertilize the cocoa trees. The pods rot very quickly. Cocoa shells, beans and oilcake all have high nutritive values and could serve as feedstuffs for livestock except for their theobromine content. The shells are a good source of vitamin D.
Cocoa beans and shells contain theobromine, an alkaloid poisonous to animals, which limits their use for feeding. The level of theobromine is very low in the pods. Cocoa products can be rendered harmless by being cooked in water for one and a half hours, filtered and dried. Fresh pods are sometimes consumed by livestock, but for efficient use they must be dried and ground. Pod meal has been fed without toxic effects to cattle in quantities of up to 7 kg per day. For dairy cows, pod meal seems to be comparable in value to corn-on-cob meal. Rations containing cocoa pod meal have a somewhat lower feed efficiency for beef cattle, but this will be compensated by the larger intake. For pigs, cocoa pod meal has replaced maize and can constitute up to 35% of the ration without decreasing weight gains. It has been fed to pigs in quantities of up to 2 kg per day. To ensure that the animals consume sufficient quantities, the pods must be sun-dried (to 60% moisture content) and then chopped, ground and pelletized. While untreated cocoa beans and oil cake can be hazardous to pigs, pig rations can include up to 25% of the processed product without reducing weight gains or feed efficiency. Untreated cocoa beans and oil cake can be hazardous to poultry.